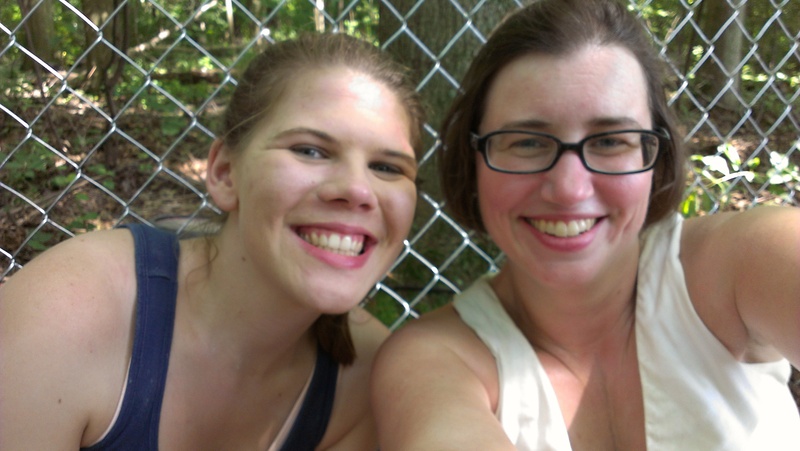 Yesterday my friend Lindsey and I went to the Firefly Music Festival in Dover, Delaware. It’s a three day festival, but we only went on Saturday. It’s an easy 2 hour drive from Baltimore to Dover, so going just for the day was very doable. It’s only the second year for the festival, but I think they’ve mostly done an excellent job with it. 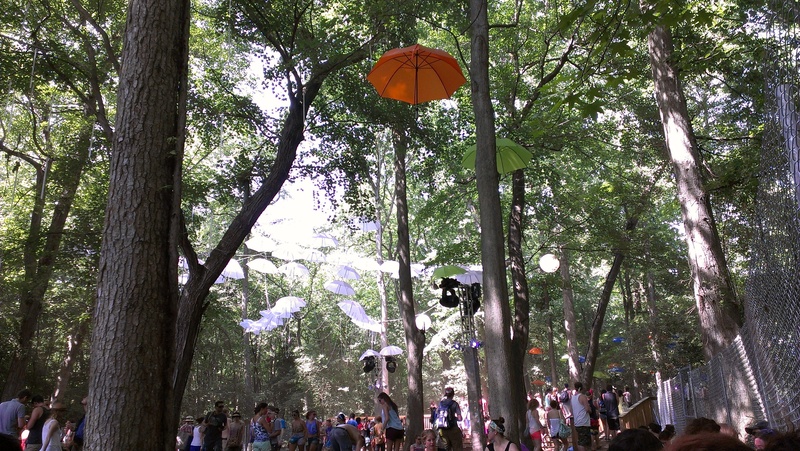 Granted I don’t have much to compare it to having not been to any of the really big music festivals like Bonnaroo. I’ve been to Newport Folk Festival, which is much smaller as well as some small one day festivals like the Virgin Festival in its various forms around the Baltimore area. 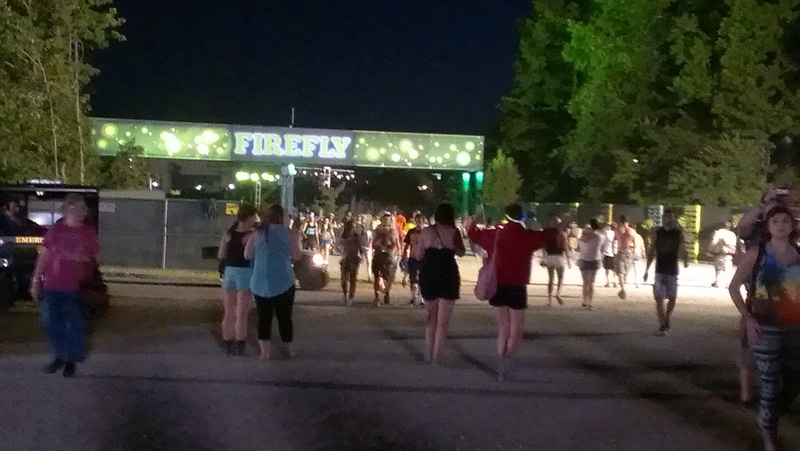 Firefly is much bigger than the ones I’ve been to both in regards to the number of people and the size of the venue. The distance between stages helps with the music bleed from stage to stage, but also makes it really difficult to stage hop because it takes so long to get between stages. Mostly it wasn’t a huge problem for us, but there were some times where it was difficult to see as much as I wanted because of set overlaps and the amount of time it took to get between stages. I guess I should mention that the festival is held at The Woodlands at Dover International Speedway. Parking is free in the speedway parking lot, which is great. It’s rare to find free parking at concerts these days. Despite the name The Woodlands there are not many trees around save for one little forested area. Also can someone please tell me what in the world that area is built on? The ground in much the area was super weird and felt all bouncy like walking on a trampoline. It was very disconcerting especially with thousands of people walking on it. I kept feeling like the earth was going to open up at any moment and swallow me up. Despite the size of the festival I never really felt like it was super crowded until the very end of the night when the musical acts dwindled to just one stage at a time. Then it was like an insane crush of people. I hate crowds so I was not really enjoying that at all. I am happy that this was only for the last few hours we were there though or I would have had a miserable time. There were plenty of services. I never really had to stand in line to get food or go to the bathroom. Well except for the last time I went to the bathroom, but that was my own dumb fault for deciding to go in the spot right next to the stage where MGMT was playing when only one other band was playing. Had I gone to any other restroom area I would have been able to walk right in. The only place I ever had to stand in line was to get water. They had water refilling stations to fill up water bottles, which was great because it would have cost approximately 1 million dollars to buy enough bottled water to stay hydrated. My one big recommendation for them for next year is to add a couple more of these stations. Oh wait, I lie I have one other recommendation. Don’t wait to open the gates to the festival grounds until 15 minutes before the first band goes on. We were pretty close relatively to the front of the line to get in because we got there and got in line almost an hour before the gates opened and we got there just as The Kopecky Family Band was going on. Had we been further back in line we would have missed their set. Despite the fact that for single day ticket holders they had to scan our tickets, give us a wristband, do a bag check, and wand us with a metal detector the line moved extremely fast once they finally opened the gates so I can’t complain about that. First up as I mentioned was The Kopecky Family Band. Since we were some of the first people in, we were able to be right up next to the stage for their set. They were definitely one of my favorite acts of the day. I actually don’t care much for “Heartbeat”, which is the single off their newest album that’s been getting a lot of air play, but I love the rest of their music. They have a great variety of instrumentation. I’ll also say it’s the first time I have ever seen anyone in a band play drums with chains before. I read this column in the New York Times a few weeks ago saying if you like Fleetwood Mac you should check out The Kopecky Family band so I was highly amused when they covered “Tusk” during their set. They were fantastic, and I look forward to seeing them again soon. Luckily they’ll be playing one of WTMD’s First Thursdays concerts in August so I won’t have long to wait. This song “The Glow” is one of my favorites of theirs. Next up we saw Imaginary Cities. I only was familiar with one of their songs prior to seeing them. They were ok, but not probably a band I’m going to be seeking out in the future. They’re not really my thing. After that we saw ZZ Ward, who love so much. I love her attitude and her blues inspired rock that you don’t expect to be coming out of a white girl. She was a lot of fun live too. One of her songs “Cryin’ Wolf” features Kendrick Lamar who happened to be playing right after her on the same stage, so I was a little disappointed that he didn’t come out and sing it with her. Stuff like that is why festivals can be great. I didn’t really see any cross collaboration happening yesterday though. I definitely look forward to hearing more from ZZ Ward in the future. If you know one of her songs it’s probably “Put the Gun Down”. After ZZ Ward there weren’t any bands either Lindsey or I were super excited to see so we took the opportunity to grab some lunch and go sit in the one shady area in the festival grounds for awhile to cool down. I’m glad we did because until I got some food in me and cooled down some I didn’t realize how crappy I had started to feel. We mostly had great weather. It was a little hotter than I would have liked during some parts of the day, but knowing Mid-Atlantic weather this time of year it could have been so much worse. It was probably in the low 80s with relatively low humidity, which was great. There weren’t very many clouds though so the sun really beat down on you and without much of a breeze it did get rather hot at times. Mostly I couldn’t have asked for better weather though, especially after the sun started to set. And we got to see the Supermoon right over the main festival stage. It’s like they planned it. Lindsey and I hanging out in the shade. 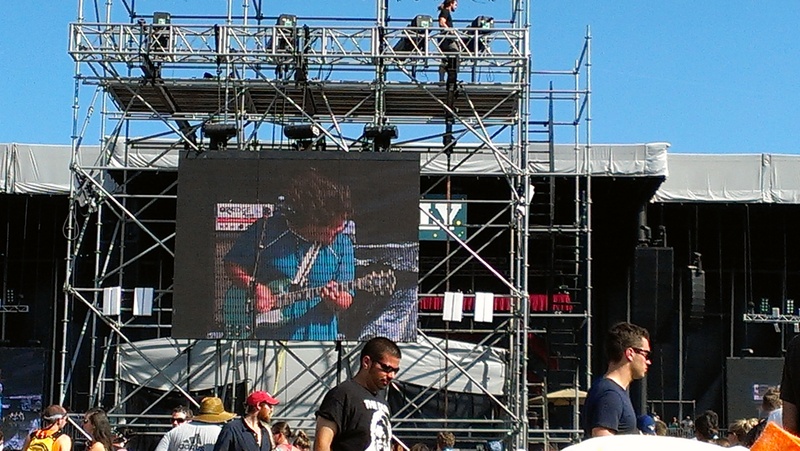 After our break we headed over the see Alabama Shakes. I don’t have much more to say about them after having seen them both at the Newport Folk Festival and the Virgin Mobile FreeFest last year. I still enjoy them, but they’re not doing a whole lot different from I’ve already seen. We left Alabama Shakes’ set a little early to make it over to one of the other stages to see CHVRCHES. I am very glad we did because they were amazing and probably my favorite act of the day. I will even forgive them their super annoying to type out name. They’re an electronic synthpop band from Scotland. Currently they only have out a 5 song EP, but their full length LP is due out in September. I had heard that they were great live, and they did not disappoint. They had a lot of interaction with the crowd, which you know I love and their music of course had everyone dancing. I would love to see them in a club venue some time. Hopefully they’ll be back around this way when they tour for their new album. After CHVRCHES we saw part of the Crystal Fighters set. I had never heard of them before yesterday, and their music is definitely not something I would listen to normally and won’t probably be listening to again in the future. However, as sometimes happens even if you don’t like a band’s music that much you can still enjoy seeing them live because they put on a great show. This was my feeling about Crystal Fighters. They had the crowd super into their show, and I had fun dancing around to them even though their music isn’t really my cup of tea. Next up was the Yeah Yeah Yeahs. I only like some of their music, but I had always heard that Karen O., their lead singer is great to see live and that was true. I wouldn’t quite put her up there with Florence levels of insane stage presence, but she’s getting close. I enjoyed their set and can see how seeing them in a more intimate venue would be fantastic. Leaving the Yeah Yeah Yeahs is when things started to get a little insane crowd wise walking over to see MGMT. I am not a huge MGMT fan, but like a few of their more well known songs like “Kids” and “Electric Feel”. I’m sure they played “Kids” at some point, but I didn’t hear it as we wanted to get back over the main stage to grab a good spot for Tom Petty. We basically stayed at the MGMT set long enough to wait out the ridiculous bathroom line over there and then walk back over to the main stage. We did get to hear them play “Electric Feel” right before we left so that made me happy. Tom Petty was the headliner for Saturday night. The last time I saw Tom Petty I was in high school and he was doing his Wildflowers tour. It pains me to think about how long ago that album came out at this point. I went to that concert with my friend Natalia, my sister, and my sister’s boyfriend at the time. For some reason my sister decided she wanted to leave before the concert was over and as her boyfriend was the one who drove us we wound up leaving before the encore. Sadly, I still have not seen a full Tom Petty set as we too left only about halfway through last night. By the time Tom Petty was playing I had had my fill of dealing with drunk people falling on me and people constantly shoving past us in the crowd to get closer to the stage. Luckily I never really felt like that for most of the day, but at the end of the night I was ready to be away from people. Also we had a 2 hour drive ahead of us starting from the time we would get out of the parking lot. I couldn’t bear thinking about how long it would take us just to get out of the festival grounds and then the parking lot if we left with everyone else. Thus I decided I wanted to leave a little after 11. So you see Tom really it’s not you, it’s me (or my sister). I really do love Tom Petty. The only box set I’ve ever owned is a Tom Petty one. I do wish that I had been up for seeing the whole concert, but I got see enough to get my fix in. He has such an extensive catalog of music that there’s no way of knowing if he was going to play it, but I do wish that I had seen him play “American Girl” as it’s my favorite. He might have played it after we left, but I didn’t want to hang around waiting for it and then not even have him play it. Lindsey got to here him play the one song she wanted so I didn’t feel too bad about asking her to leave a little early. I’m very happy we did leave early though as even with almost an hour left in Tom Petty’s set it took us almost 45 minutes to get out of the parking lot. As it was we didn’t get back to Baltimore until 2 am. I can’t even imagine how late we would have gotten home if we had stayed. As I was already driving dead tired halfway through the trip home I’m glad we left. I think it was the smart move. 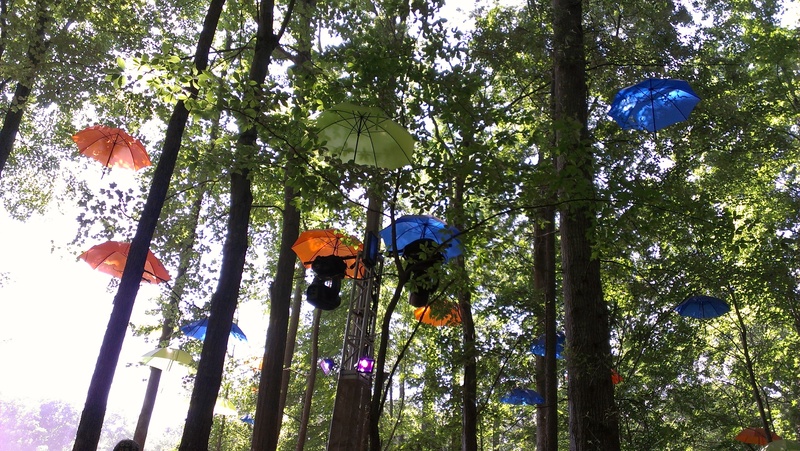 I had a great time during my day at the Firefly Festival and will happily return again next year.